I have a subscription to newspaperarchives.com. I mined the site for information and bled it dry more than a year ago, or so it seemed. Since then I would find random articles on new topics or people that I hadn’t looked up before. It was starting to seem like I had gotten about all I was going to from the site and I was considering taking a break from the subscription. That was until this past weekend. 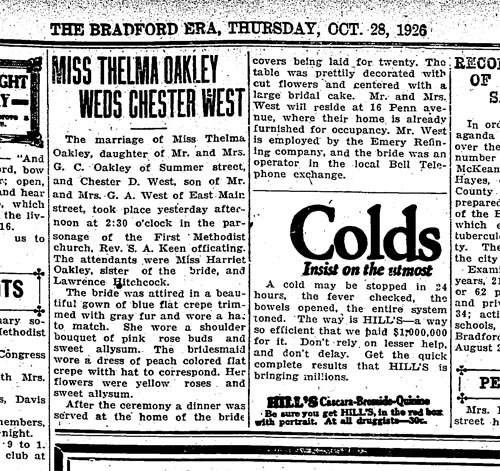 I can’t remember what name it was that I was looking up but that name and then what I found triggered yet another search and suddenly I noticed papers from years in my hometown that hadn’t been available before. To test it I typed in my maiden name, previously it would come up blank, not this time. There I was in all my youthful glory, egad. At some point in the past several months, or more, seeing as I wasn’t paying close attention, newspaperarchives.com had filled in some missing page ranges. WOW. This, of course, would lead to massive random uncontrolled searches. I was like a kid on a sugar high. In all the flipping and flopping around I spotted that they had filled in some of the papers from the 1920s. I typed in my grandfather’s name, Chester West. Typing in West alone creates a massive glut to dig through, most having nothing to do with a name and every thing to do with a direction; Chester definitely narrows the field. Up popped new results including the wedding announcement for my grandparents and this was going to solve yet another photographic mystery. Hanging on my living room wall is a photograph of my grandmother; she appears to be at least 18 years old if not in her twenties. 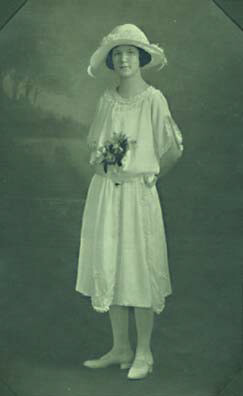 The dress is either white or a very pale color with a matching wide brimmed feather decorated hat. The dress was hemmed just below the knee and grandma had on white stockings and shoes to go with it. A nosegay was tucked into the ribbon sash belt. My mother guessed it was her wedding outfit. From the write up we would discover that this photo was not her wedding dress. In the announcement it describes a blue dress with fur trim and a matching hat. So the photo wasn’t her wedding dress, although it had to have been, so it seems, some type of special occasion outfit. Now it is the new mystery. Next Entry Take Time to Stop and Smell the . . .